Outside of maintaining belief, authority is a critical component of faith. Christianity has many authorities which it appeals to: a deity, a holy book, clergy, the congregation, and family. Each has its own role within a hierarchy, and each thing has its own authority to govern one’s thoughts and actions. 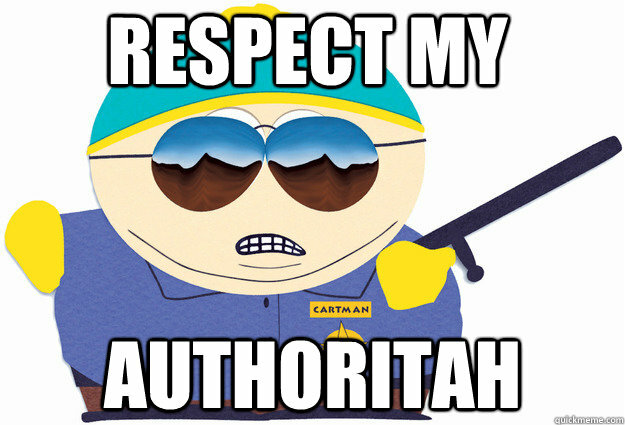 Authority is important because it helps suppress healthy boundaries and reinforces social norms to keep people believing. Authorities are to be believed and relied upon. Without question. I wrote recently about someone who went to a pastor for counseling. This wasn’t an accident; pastors have authority to give counseling within a specific church community. People are supposed to trust clergy with helping them make decisions regarding their immortal souls. Reality speaks otherwise as to whether this trust is adequately placed. We don’t even require the same licensure for clergy as we do for people in similar secular positions. Social authority to this day still is a substitute for showing one’s credentials. More broadly, this also means that one has to show deference to this unearned authority. Relationships are not merely two people interacting with each other for mutual benefit; everything has its own rank and order in life. Your friends might be important to you, but they aren’t supposed to be as trusted as your pastor or more godly sources. No belief means no authority. Admittedly, this is the most aggravating prejudice I receive from Christians I interact with. There are dozens of ways some Christians will show this. Talk about TRUE CHRISTIANS(TM), presuppositions, bias, and other catch phrases, and we’re getting into the excuses why a person isn’t supposed to be trusted, not the merits of his or her position. In many ways, I’ve had conversations with people who treated me like I lied with every word coming out of my mouth. Authority and its trappings are what makes conversations with Christians incredibly frustrating for deconverts like me. We know what it’s like to talk with someone who is politely shitting on us. Others might chalk that up to bad manners or impoliteness, but actually it’s people being dismissive for no good reason. If it was, there wouldn’t be much gossip in church groups. Rather, it’s the way things are because of a deity. That’s why no matter how hard one tries to establish one’s credentials on a subject, one can still get met with being denounced as a fraud. Also, it’s why holy texts are given inordinate weight over what people can observe with their own eyes. Respect actually has nothing to do with Christian authority. One doesn’t have to like or dislike a person in authority; one is only required to obey. The relationship has meaning within church circles, and it reinforces obedience out of divine mandate rather than mutual assent. Assent doesn’t matter. Consent doesn’t matter. Just obey. It explains why a lot of church-related relationships are unhealthy. Married deconverts know this all too well. Within church settings, married Christian couples carry a good deal of authority. Lose belief, and all of a sudden one spouse is the subject of ridicule and pity. Worse, there’s a loss of authority within that church setting, so the still-believing spouse becomes a social leper. That spouse gets punished for the actions of another autonomous adult. Often, the only way that spouse gets to vent frustration is at the person who deconverts. That said, it’s not just limited to marital relationships. Every relationship is actually abused as collateral when a person leaves the flock. At that point, one can see that these relationships were about the pretense of mutual support. In reality, they only go so far as the message one is supposed to repeat. Losing these relationships hurts because trust gets broken in permanent ways. Deconverts frequently are the ones left with trying to repair the damage that Christian friends and family cause.